Motherwell manager Mark McGhee was delighted to claim his first victory since returning to the club, defeating Kilmarnock 1-0 at Rugby Park. 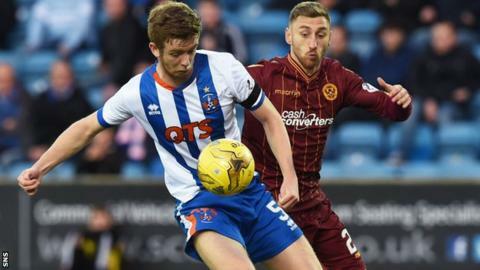 Well rode their luck at times as Killie created opportunities, but Louis Moult grabbed a late winner for the visitors. McGhee continues to search for his best team and formation three matches into his second spell in charge at Fir Park. "I'm still in that learning curve and to be winning while you're doing that is a bonus," he said. "Given the process we're going through, learning about the players, you know we changed the strikers today and played a different shape from the other two games. "You can undermine yourself a bit when you're playing about with it, but I thought it was terrific. "We kept a great disciplined shape, made it very difficult for Kilmarnock and gave ourselves a platform to win the game." Asked if he felt with each training session and match he was getting closer to knowing his best team, he said: "It's my job to bring what I see to bear on the squad, to find a way of playing that best suits the players we have. "So I'll continue for the moment to give people an opportunity and play about with the shape a little bit and with players in certain positions. "But I think we've got a long way to go from knowing exactly where we are and where we should stand in the league." The result keeps Motherwell in 10th position, but they move to within a point of Kilmarnock, whose manager Gary Locke felt the outcome was harsh on his players. "I thought we played really well in the game and, if we take our chances, we win the game comfortably," he said. "I thought we dominated the game, but Motherwell did look dangerous on the counter-attacks. "But I'm really frustrated and disappointed because I certainly don't think we got what we deserved from the game. "But, when you get the chances, you've got to take them." While disappointed by the defeat, Locke admitted it was a different disappointment from some of the heavy losses they incurred earlier in the season. "We got beat in a couple of games and it was a really disappointing manner in the way we were beaten," he continued. "We're certainly not happy at losing the game, but if the lads give us that effort and commitment week-in, week-out, we'll win more games than we lose."